Mae December discovers the body of her neighbor Ruby Mead-Allison after Ruby fails to pick up Elvis, a Pomeranian, who Ruby had boarded with Mae. The mystery of Ruby’s death is complex, especially since Ruby had a number of enemies. Sheriff Ben Bradley begins the investigation, but Mae seems unable to stay out of the thick of things. 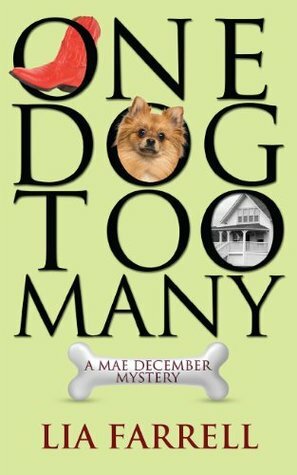 One Dog Too Many is a very pleasant cozy mystery, set in a rural Tennessee town. Everyone knows everyone which both helps and hinders the investigation. I really like Mae and it was interesting to learn about the dog boarding and breeding business. Sheriff Ben is newly elected and he lacks confidence, but he is determined and smart and he has a lot of assistance from Wayne, his lead detective. He also gets a lot of help from Dory, his office manager who has “outlasted several sheriffs in her forty-year tenure. Showing no signs of slowing down, she ran the office like a well-oiled machine.” Dory is a wonderful character and I love the fact that she is able to navigate cell phones better than either Ben or Wayne. The plot has a lot of twists and turns, some relevant and some not relevant. The novel reads rather like a police procedural in that it has a clipped crisp writing style. At times I would have preferred a less abrupt style, but the information is transmitted clearly. The pacing is slow and deliberate until the very end, when the action is breathtakingly fast and full of suspense. The author has worked carefully on the setting so that I really did feel as if I were a part of this rural town and I could picture the scenes as well as the people. Character interactions and the descriptions of daily life definitely ring true, and the characters seem to be very real. Fans of the cozy mystery will certainly enjoy adding Mae December to their list of charming detectives. She manages to solve the case very satisfactorily.